Capoeira? What Kind Of Martial Arts Training Is That? Most people have heard of mixed martial arts training, and nearly everyone can tell you that Jiu Jitsu is a martial art and not a dish at a Japanese restaurant. But Capoeira? It’s certainly not a word that’s become commonplace in American homes…yet. 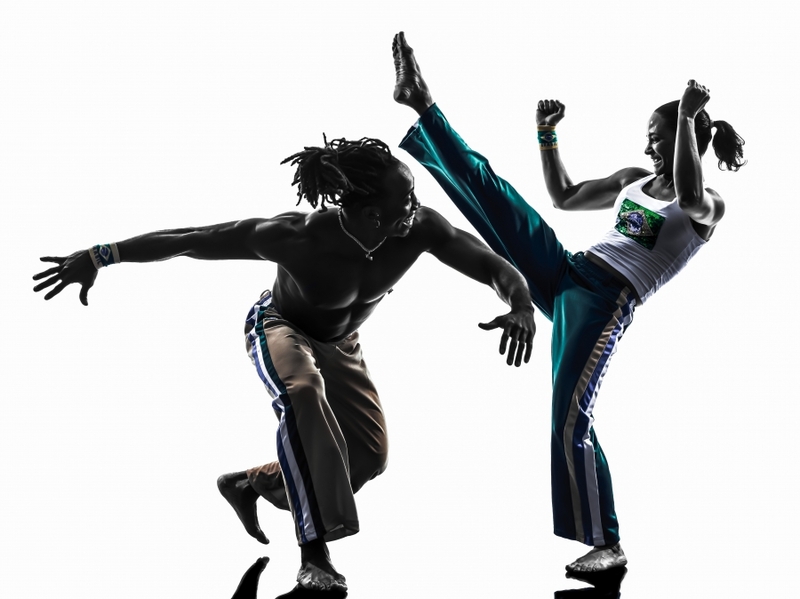 Unpredictability: Capoeira has been described as “self-defense disguised as a dance.” While at first it might seem playful, it can quickly lure an opponent into a false sense of security. Capoeiristas are constantly moving, which prevents them from becoming an easy target…there’s no “starting stance,” and the legs are the main weapon. Constantly moving is a way to keep the opponent off-balance. The Game: To onlookers, The Game might just seem like a dance…two capoeiristas will do incredible kicking, coming incredibly close to making contact without actually doing so. (Some have equated it to close-quarters breakdancing, but the connections between the capoeira and breakdancing are disputed). In fact, they’re actually showing off just how skilled they are compared to the other person by not making contact. They’ve established that they can make contact without having to do so. Commercials, video games, and movies: Capoeira is often performed to music, and you know one of the songs even if you’re not aware of it…the Zoom Zoom tune heard in Mazda commercials is actually a capoeira song. Video game characters in Tekken and Street Fighter have used this martial arts training as their fighting style. And you might not know it, but you’ve probably seen it in some movies as well. There are few forms of martial arts training that will exercise your entire body as much a capoeira. Contact us if you’d like to find out more about it.